Click the tabs for the full Weather Story. Widespread snow is expected across the southern two thirds of the state Sunday night through Monday. 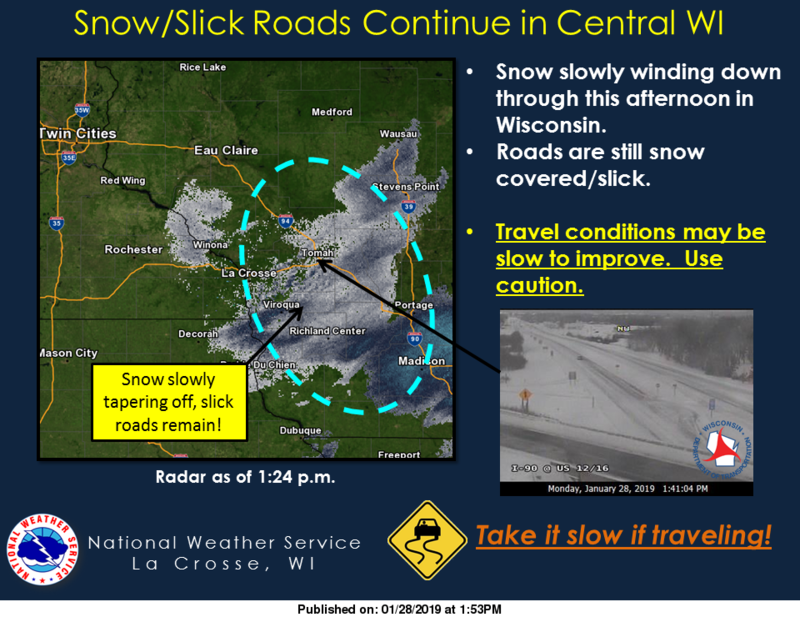 Over 6 inches are possible across the southern half of Wisconsin. Areas from Door County to Kenosha could see higher totals, due to lake effect snow. There is still some uncertainty with the track of this storm and we will have a better idea of snowfall totals later this weekend. 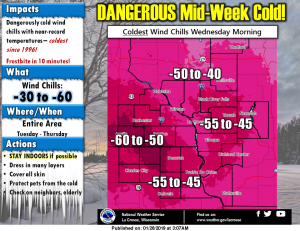 After the snow, dangerous and potential record cold sets in mid-week for the entire state. 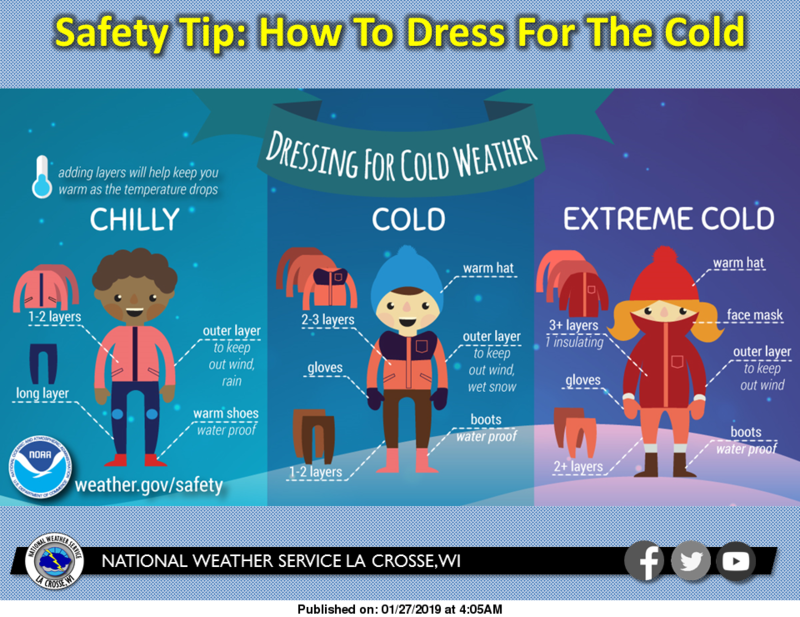 Beginning Tuesday, low temperatures will range from -20℉ to -30℉, combined with wind chills of -40℉. These bitter cold temperatures will continue into Thursday. 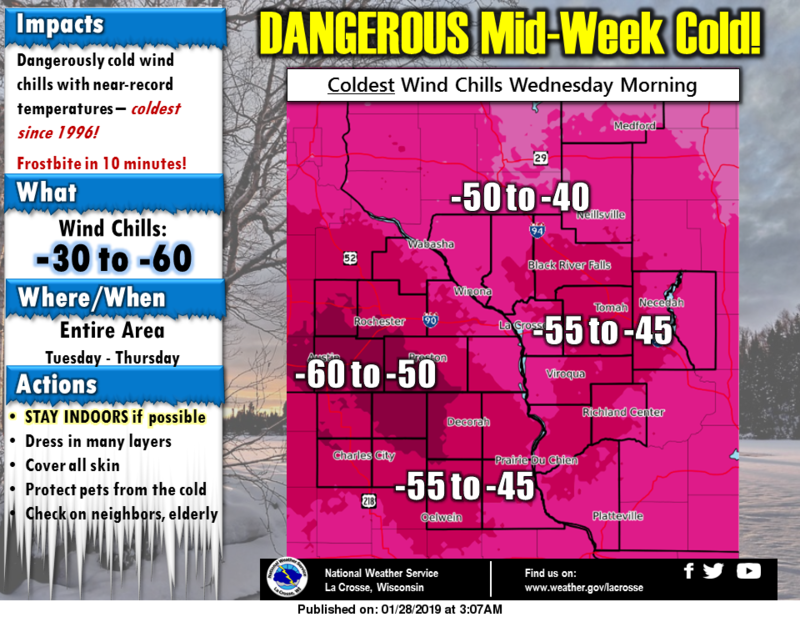 The Superior area could see wind chills near -50℉. Limit your time outdoors. If you must be outside, dress for the weather. 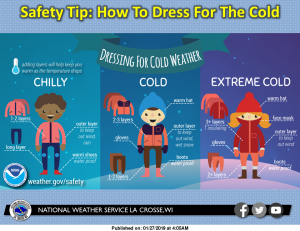 Wear loose-fitting layers, a hat, gloves and snow boots. Make sure you have a scarf or some other way to cover your face. 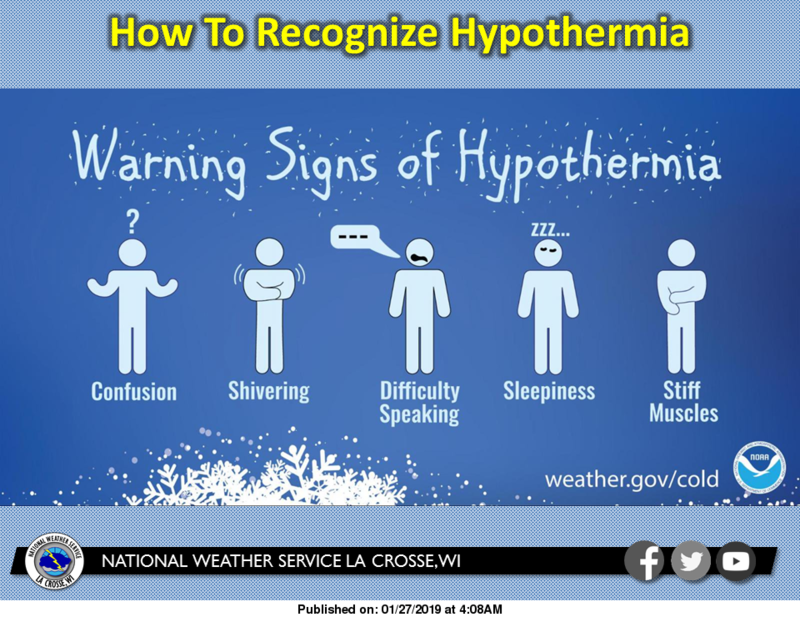 Know the signs of hypothermia, which include excessive shivering, exhaustion, confusion, and slurred speech. If you or anyone around you begins to show symptoms, call 911 immediately. Know the signs of frostbite, which include a white or grayish-yellow skin area, skin that feels unusually firm or waxy, and numbness. 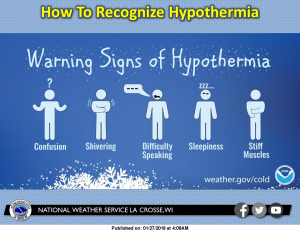 If you detect symptoms, get to a warm area. Do not try to rub them, as it can cause more damage. 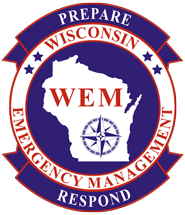 Check the supplies in your home and vehicle emergency kits. If food items or batteries have expired or run low, replace them. Test the smoke and carbon monoxide detectors around your home. If you can’t remember the last time you changed the batteries, go ahead and replace them. Check your furnace to make sure it is working properly. If you rely on heating oil or propane, make sure you have enough to last through the current period of cold temperatures and schedule a delivery before you start to run low. Do not attempt to use gasoline or propane heaters or a grill to heat your home or garage. Those devices produce carbon monoxide, which could be deadly in enclosed areas. Prepare your vehicle for the possible effects of the cold weather. Keep the gas tank at least half-full. Pack an emergency kit with items such as food, water, extra blankets and warm clothing, booster cables, and a cell phone charger. Make sure water pipes in unheated areas are properly insulated. If you have faucets served by exposed pipes, let water drip from them or run at a slow trickle to prevent freezing. Open kitchen and bathroom cabinets to allow heat to get to the pipes. If you have pets, limit their time outdoors. Dogs and cats can get frost-bitten ears, nose and feet if left outside during bitter cold weather. For livestock, make sure they have access to extra food and a water source that will not freeze over. Outdoor animals need access to a dry place to seek shelter. Help provide a windbreak for larger animals and an enclosed space for smaller animals to help them retain their body heat. With the recent flooding in the area, many people are looking to help their fellow neighbors clean-up what the waters left behind. While rain can wash away dirt and small debris during normal rain events, flooding as has recently been experienced can carry with it embankments, trees, roads, and numerous other items. It is also important to recognize that it is not just the large debris that can cause problems in flood clean-up as flood waters often cause damage to gas tanks, sewage systems, and other systems containing chemicals and bacteria. To ensure a community can remain healthy and active after a flood event, clean-up is vital. Though it can take a lot of time and effort, a well-organized and prepared group of volunteers can be the solution to that. It is important for anyone cleaning after a flood to take precautions to protect themselves and their families from the potential hazards existing in flood waters. All volunteers should wear rubber boots and pants for walking in mud and small amounts of water. Please take caution while walking on muddy surfaces, as mud can be extremely slippery. Depending upon the type of work being done, volunteers should also be wearing either heavy-duty work gloves or latex-free gloves. One of the most important steps to volunteering in clean-up efforts is checking in with the community you are helping out in. By checking in, you can be sent to the clean-up effort that best fits you. Some are not able to carry items out of basements while others may not be able to tolerate cleaning with bleach or vinegar. To best ensure that the right help is getting to the right places, communities seeking volunteer help will provide information to local residents on where to check in if they are needing volunteers to help them or if they themselves are willing to volunteer. Common roles people might play in flood clean-up are carrying damaged items from basements, mucking out mud and other flood debris, wiping down and cleaning walls and floors. Also, individuals who are able to volunteer with equipment such as skid steers can also play a vital role such as in helping move garbage from the curbside to dumpsters, thereby keeping the streets clean and accessible. Checking in at a volunteer registration location will also help these communities as all of the time logged by volunteers is reported to FEMA to help show the extent of damages and the needs of the municipality. Checking in also reduces the liability to the municipality or community requesting the volunteers. It would be an unfortunate situation if a volunteer were to get hurt and had not checked in prior to assisting. In addition, spontaneous volunteers who simply show up to a location without checking in at a registration center can overwhelm communities that are not prepared for them and may have too many people at one location and not enough at another. Volunteers are a vital role in flood recovery, and efforts to help the community are always appreciated. However, when these efforts are not organized or volunteers are not appropriately prepared for the working conditions, simple clean-up can become its own disaster. The DNR is recommending that if wells are submerged they should be disinfected prior to completing a well sample. Please contact the Public Health Department or check out our website for further information regarding the technique involved with disinfecting a well. The Public Health Department is recommending that all well samples be collected when they can be tested during the work week. By doing so, a property owner avoids having a sample being considered too old to test. This is particularly important due to the upcoming weekend. Water test kits may be picked up at the Community Services Building Monday through Friday from 8am – 5pm. Avoid wading in water without proper foot protection. Broken glass, metal fragments, and other debris may be submerged in the flooded area. Wear proper eyewear, gloves, and other protective equipment when cleaning an area. If you are cut or punctured, contact your physician or local health department as soon as possible. Tetanus vaccinations may be necessary. We have tetanus available at the Community Services Building.